Fashion shows are typically held to promote the fashion designers clothing line to key retail store buyers and the international press. Runway collections may consist from Haute Couture or Ready-to-Wear, to casual clothing and swimwear or any other category of clothing (note, the fall fashion collections normally would not show swimwear or shorts). The fall shows are for the fashion designers to display the collection that they intend to sell to the stores for the following fall selling season. Often the shows are referenced as "Fall/Winter" or "Fall-Winter" or simply "Fall" or "Winter". When describing the show, a designer will also normally state the year. 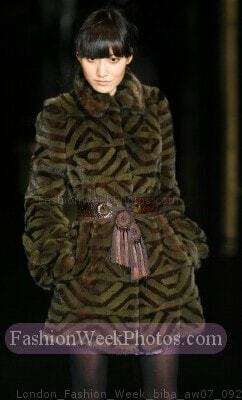 For example, the designer may be showing the "Fall 2010 Collection" or "Fall/Winter 2010 Collection". If you are a fashion designer that is getting reading to display your fall fashion collection, please let us know about it... We can post your fall fashion news here on Apparel Search. Learn more about Fall Fashion and Fall Fashion Collections. Are you looking for complete coverage of the runways and fashion weeks in New York, Milan, London, Paris, Tokyo etc., from menswear to couture to ready-to-wear to resort? Find fashion stylists for to help at your fashion show. Read fashion news or fashion magazines to learn more about fashion. If you enjoyed learning about fall fashion shows, you may also have interest in learning about spring fashion shows.